Through the years, we have found our fair share of extremely successful marketing companies. Stretching across a broad spectrum, the marketing companies we have featured on our show all share one common trait: thinking outside the box! While marketing companies are a dime a dozen and will promise everything in the book, it’s common to find that many marketing agencies fall short and it’s because of their inability to truly relate to the demographics of the companies they are working for. Before we really get into this story and how marketing is changing more than pretty much any industry out there, you first have to understand that marketing isn’t a job, but instead a relationship. 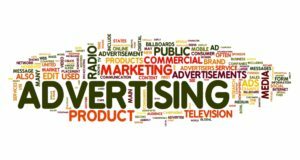 If you’re in marketing, whether running the marketing agency or working for the marketing agency, if you look at marketing as a job, you have already failed miserably and it will only be a matter of time until you’re out of business. To look at marketing from the proper perspective, you have to look at it as though you’re building relationships, even friendships, with the demographics of the companies whom have hired you. Let’s face it, it’s not really about building the relationship or trying to please the company that’s hired you, it’s about their customers…their demographic! If you make their demographic happy, they will be happy with your marketing agency. By no means is this easy. Companies and corporations come in all shapes and sizes and within those companies and corporations are people who are control freaks, people that are simply “yes people” and people that question everything. Some people are sticks in the mud and refuse to change and, if you’re one of those people, why you would hire an outside marketing agency to begin with is well beyond my intellectual capacity. But, there are those people and there are those exact situations. I’ve seen them first hand and always ask myself and ask the people involved, why would you even waste your time with a marketing agency if you’re going to disagree with everything they have to say? There’s usually no response. Here’s how marketing has truly changed. 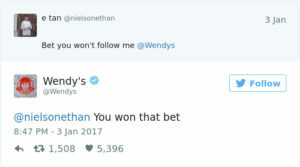 Recently, Wendy’s…yes, “Wendy’s”, the fast food, burger-making, freckled little girl logo company…has recently altered the world of marketing with a barrage of comeback tweets! Take a look at some of this!!! Now, some may wonder, “how in the world can talking back to customers be helpful or even useful?” Don’t get me wrong, there’s a completely wrong way to talk back to customers but if you notice, Wendy’s has found the right way to talk back. They have done so with humor. They have done so with gusto. And why is this good? Because you’re paying attention. Look at this, I’m writing about Wendy’s right now. 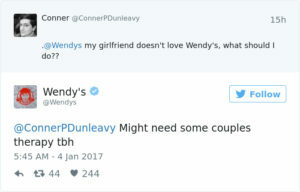 I’m not a fast food fan and yet here I am talking about Wendy’s! Why? Because they made me do it. 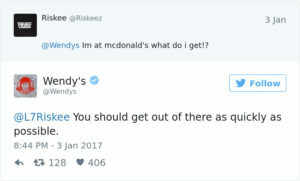 What do you think Wendy’s would say if I told them I didn’t like them? They’d give me a witty comeback and send me on my way. They’ve perfected it. They’ve ultimately become the Andrew Dice Clay, the Rodney Dangerfield, and the James Fridman all rolled into one! 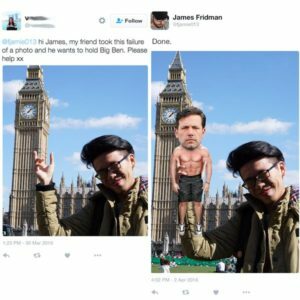 By the way, if you don’t know who James Fridman is, Google him and do it quick. Better yet, check out this article about him! He’s the guy who makes fun of people by using their Photoshop requests against them. He’s become so popular that people literally send him stuff just so they can see what he comes up with and how badly he can bash them! But I guarantee you that some of you are out there thinking, “Why in the world do people want to get made fun of? 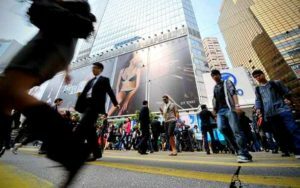 Why would people want to get bashed?” The answer, while deeply rooted in psychology, is quite simple…people yearn for attention. Think about it. If a kid constantly does bad stuff and gets yelled at for it, but does good stuff and gets ignored or gets told, “Why should I thank you or congratulate you for something you should be doing?”, what do you think that kid is going to do?!?!? He’s going to act out so he receives the attention he so desperately needs. Forget want, attention is a need. If people are getting attention, they are happy. It’s as simple as that. So, if you want to be successful in marketing, don’t stay boring. Don’t fear change (not even pennies, LOL). Start to think outside the box and get creative. And, if nothing else works for you, think about what Wayne Gretzky once said, “You miss 100% of the shots you don’t take”. Meaning, if you don’t try, you’re not going to succeed at it!